Do you ever suffer from migraine symptoms? One of many common migraine symptoms: “Not tonight honey, I have a headache.” A saying we have all heard or said. But what happens when it is not just a headache? What happens when it is one of those “headaches” that makes you hide away from the world? Migraine symptoms can make you shut your curtains, lock your bedroom door, and turn off the phones. Sometimes migraine symptoms can be so debilitating that you cannot stand a single sound or handle an ounce of sunlight. These headaches, called Migraine’s, provide a very unpleasant experience. These migraine headaches have been identified as Neurological disorders. There is a multitude of causes, triggers, and symptoms. When anyone gets a migraine, they immediately start looking for migraine cures, and often use medications. However, the medications used for migraine cures have a number of negative side effects. Have you have ever suffered from a migraine headache, and then had to experience the side effects of the medication, which is not always effective? You’ll be glad to know that there are very effective alternative migraine cures available. Both Hypnosis and Neuro-Linguistic Programming add an effective alternative Migraine treatment to the traditional Migraine treatment options mentioned above. According to a study published on September 15, 2015, in an online issue of Neurology (R), a journal published by the American Academy of Neurology, there are new blood markers that could help determine who is at a higher risk of experiencing Migraine symptoms. 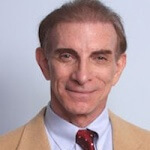 This testing was conducted by Dr. B. Lee Peterlin, DO., who is with John Hopkins University School of Medicine. This test determined that there are certain lipids found in a decreased concentration in patients who were reported to be prone to Migraine headaches, versus an elevated concentration found in patients who have reported to never experience migraine pain. This, of course, is still in early stages of study and further research could help isolate a specific cause and better help establish a cure for migraines. Where there has been much speculation in the medical field as to exactly what causes a migraine headache, there has been no definitive conclusion. Specialists in multiple institutions such as the American Academy of Neurology (AAN) and the University Of Maryland Medical Center have concluded that there are those with increased risk factors. Those who are at a higher risk are between the ages of 25-55 and female. These are just a few triggers that are typically associated with an oncoming Migraine. They are subjective and could differ from person to person. But, they are reported more often than any other as symptoms of a migraine. Migraine symptoms are not always present to indicate the onset of a migraine. At times, the headache is abrupt. But when they do give you a warning, warnings can differ from person to person. Migraine symptoms can include any combination of the following: Sudden sensitivity to light; change in appetite; “aura” or changes in perception such as blurred vision, flashing lights, nausea, changes in mood, sensitivity to sound and many more. When these symptoms occur, it is traditional that we reach for a migraine cure or some sort of relief from the migraine headache. These migraine cures can either be over the counter or prescribed, depending on the frequency in which you develop migraines. Over the counter products are usually Aspirin, Acetomenaphin or anti-inflammatories like Motrin or Ibuprofen. 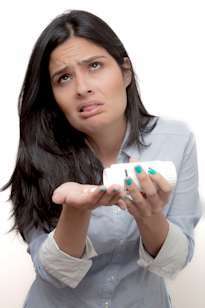 According to the University of Maryland Medical Center, possible prescriptions to help relieve the symptoms of a migraine include: Antidepressants; Botox injections; anti-seizure medication like Depakote; beta-blockers like Propranolol; and Triptans (serotonin agonists) like Sumatriptan, just to name a few. There are also some herbal remedies that can be explored as well as cognitive behavioral therapy. Traditional migraine treatments do not actually offer a cure; they merely offer a way to alleviate the migraine symptoms. These traditional Migraine treatments offer a large number of side effects. Many of these side effects are as adverse and debilitating as a migraine itself. 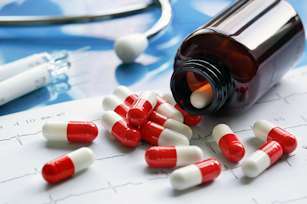 Side effects such as: Nausea and vomiting; diarrhea; cramping; tingling sensations; loss of hair; dizziness; insomnia; blurred vision; weight gain; heart palpation; incoherence; and many, many more. Other treatment options that have been proven to provide highly effective migraine cure is Hypnosis, as well as Neuro-Linguistic Programming (NLP). These forms of migraine treatment are a lot less stressful on the mind and body, and have the potential to offer a migraine cure versus merely a treatment. These treatments can be administered by a professional hypnotherapist. There are also CD’s on the market that can be just as effective as office visits, and can eradicate the constant high cost of treatment. Perhaps the biggest benefits to these modalities are the lack of side effects, and the ability to learn how to abort a Migraine before it “takes hold”. Hypnosis NLP can often offer a more long term Migraine cure. They work by reprogramming your brain to experience or process the pain of an oncoming migraine headache in a different way, by redirecting your thought process. There has been a multitude of research done on the benefits of hypnosis and NLP for the treatment of acute pain. According to a study conducted by Mount-Sinai hospital, hypnosis has been used to successfully treat many pain issues like: Arthritis; spinal issues; and yes, headaches and Migraine headaches. Triggering the release of endorphins in the brain. Endorphins are natural opiate like substances. Creating vasodilation, or the expansion of the blood vessels in the brain. This technique causes excess blood pressure in the brain to be reduced, which relaxes pressure against surrounding brain tissue. These techniques can be achieved by either seeing a professional hypnotherapist, or obtaining self-hypnosis CD’s or MP3’s. The difference between the two is simple: Cost and time. As with any professional, you will want to research the credentials and experience of the hypnotherapist that you choose to treat your migraines. When you seek professional assistance with hypnosis or NLP therapy, there are expensive professional fees involved. In addition, unless your hypnotherapist teaches you self-hypnosis, you will never become independent of the therapist. Self-hypnosis is helpful when suffering from migraines. Migraines do not come when you expect them, and most of the time you cannot wait to see your therapist to effect relief from a migraine. 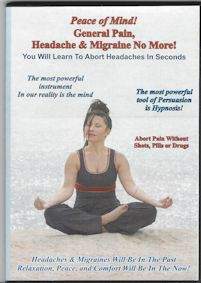 Hypnosis CD’s and MP3’s Relieve Migraine Symptoms When You Need Relief! Hypnosis CD’s and MP3’s are created by professional hypnotherapists. So, you would be sacrificing nothing to use this method of treatment. It is less time consuming and expensive, and always available when you need to cure a migraine. You aren’t burdened with having to wait to make an appointment while you continue to suffer. Just like when you choose a therapist, you’ll want to research the hypnotist you are purchasing the CD’s from. Check his credentials and level of experience? Migraine headaches are debilitating. Sometimes you are aware that they are impending, and sometimes they come without warning. There are several migraine symptoms and triggers, and some hypnosis techniques can be used to abort them. But there is still no definitive evidence as to what causes migraine headaches, and there is no permanent cure. There is of course, a multitude of medications, both over the counter and by prescription. The medications carry just as many negative side effects as the headache itself. There are alternatives to the adverse side effects of medication: Hypnosis and NLP. These methods have been proven effective in curing many cases of chronic pain. This includes migraines. Reprogramming how you perceive the pain of a migraine headache could lead to a viable migraine cure. Have you have ever suffered from a migraine headache, and then had to experience the side effects of the medication, which is not always effective? You’ll be glad to know that there are very effective alternative migraine cures available. Several clients of mine who were formerly suffering from headaches – or even severe migraines and other excruciating body pains – report the same success… all without the high costs and dangerous side effects of medication! This entry was posted in Headache & Migraine Relief. Bookmark the permalink.